AP DSC 2014 Exam Pattern-AP DSC 2014 New Syllabus Updates at apdsc.cgg.gov.in: The examination pattern of AP DSC has changed i.e. new exam pattern of AP DSC-2014 exam is conducted on Single Exam of TET+DSC in the Name of TERT. The State Government of Andhra Pradesh is confirmed the New Pattern for DSC 2014 Recruitment Examination in the name of AP TERT 2014. The DSC-2014 Recruitment Examination will be conducted on the Label of AP TERT (DSC+TET) with Paper-1 and Paper-2 in two Sessions and it contains 250 Questions and 3 Hours of Time Duration.According to the commissioner and Director of School Education, Hyderabad, Andhra Pradesh will issue the Andhra Pradesh State Teacher Recruitment Notification 2014 for filling up more than 13,000 available Teacher vacancies under AP DSC 2014 Recruitment Notification. According to the available information the AP DSC 2014 Teacher Recruitment Notification will be declared on the last week of July 2014 Respectively. New Exam Pattern consists of Paper -1 and Paper-2 where DSC-2014 Recruitment Examination is Conducting in the Name of (DSC+TET=TERT) Teachers Eligibility and Recruitment Test-2014. The TERT Paper-1 Examination test is conducted for who is not qualified in TET or who have not attended TET.The Candidates who have applied and attend for Paper-1 should also attend for paper-2 Examination. The SGT and Equivalent Cadre aspirants, who are going to write SGT and Equivalent Cadre Exam, should also attend for TERT 2014.
it is conducted at the Morning Session of the AP DSC 2014 Recruitment Examination. 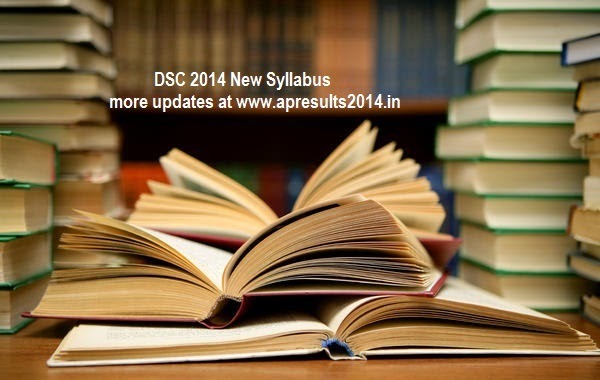 The AP TERT 2014 Recruitment Examination Paper-2 consists of totally DSC Syllabus. Aspirants who had TET Qualification they can directly apply and attend to the DSC / TERT-2014 Paper-2 Examination. The DSC / TERT Paper-2 Question Paper consists of 250 Multiple Choice Questions for 250 marks (each Question is given 1 Mark)and the Time Duration is 3 Hours and the exam was conducted in the after Noon Session. AP TERT-2014 paper-1 Qualifying Marks: 160/250 (60%) for General, SC/ST/PH (100/250) 40% Marks. candidates who has applied to the DSC 2014 Recruitment School Assistants or Equivalent Cadre Those Candidates can apply to the AP TERT 2014 Paper 2 Exam. The qualifying marks for TERT-2014 is General Candidates should Get 60% (150/250), OBC Candidates have to get 50% Marks (125/250) and SC/ST/PH Candidates should get at least 40% Marks (100/250). Who are eagerly waiting to apply the DSC-2014 Recruitment notification they can apply for AP TERT 2014 Paper-1 and Paper-2 Examinations: Aspirants can download the Previous TET and DSC Old papers or Previous Model Question Papers form the official site.